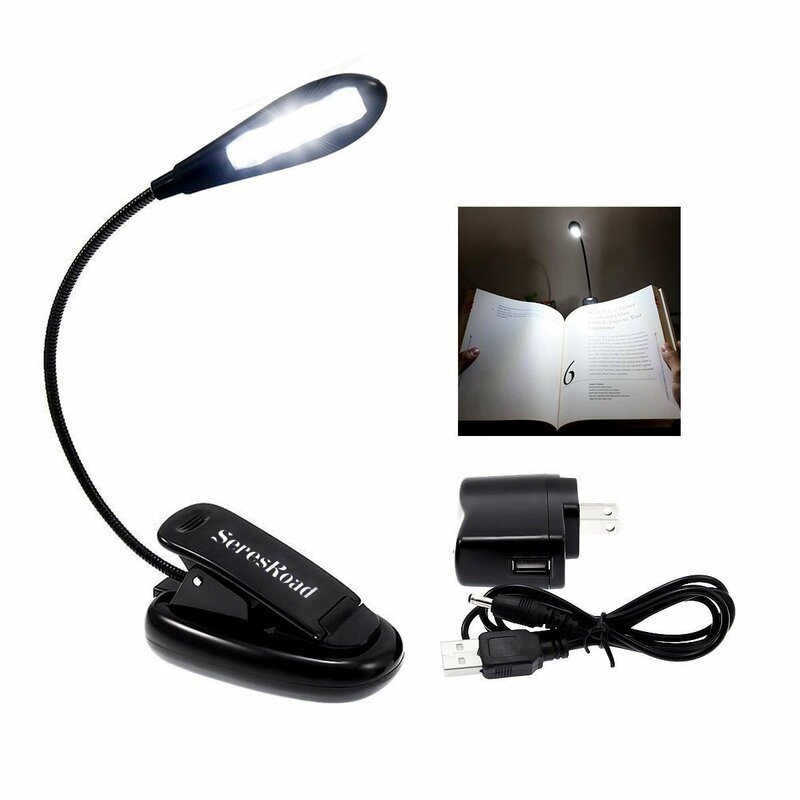 Home › Energy-Efficient LED Lighting › Book Light Seresroad Extra-Bright Rechargeable 4 Led Reading Lamp Portable Mu..
Book Light Seresroad Extra-Bright Rechargeable 4 Led Reading Lamp Portable Mu..
RECHARGEABLE AND SAFE. A Built-in 1000mAh lithium rechargeable battery makes the light eco-friendly and rechargeable. And a protective circuit inside in order to prevent overcharging, discharging and short circuits makes it safe. Charge the light by connecting it to the power adapter provided or your computer's USB port or suitable DC5V chargers. SUPER BRIGHT. The light contains 4 LEDs and 2 brightness modes: low and high. A switch button behind: 1st click low light, 2nd high, 3rd off. CONVENIENT, PORTABLE AND LIGHTWEIGHT. It is convenient thanks to its lightweight as well as its bendable and adjustable arm which makes it portable and easy to be carried. MEET YOUR MULTIPLE NEEDS: The secure clip and the totally flexible arm allow you to position and focus light on exactly wherever you want. Serve you well for multiple purposes including: clipping onto music stands, pianos, orchestra pits, books (night-time reading), craft tables (DIY), illuminating keyboards, baby nursing and so on. WARRANTY GUARANTEED: Support 30 days money back guarantee & 1 year warranty. Pattern Name: 1Arm-4LED Sturdy/durable/lightweight/Eco-Friendly/Easy to pack Flexible Switches - Each arm features its own independent switch. There aretwo brightness modes that can be selected by pushing the small round button onthe back Small & Convenient - The base of the light can be placed directly on a desktop and the arms can be adjusted to save space. Perfect Designed for professional musician,Students dorm room,music rehearsals or for those away trips for work Specifications: Working Voltage: 5V DC Input Voltage: 100-240V AC LED Quantity: 4 Charging time: 2.5 hrs (USB charging cable included) Discharge time of full charging: 4 hrs at Full Brightness, 4 hrs at HalfBrightless Life Expectancy: 10000 hours Dimension: 90 x 45 x 200mm / 3.54 x 1.77 x 7.87inch Packaging included: 1x Clip-on Lamp 1x USB cable 1x AC adapter If there's something you are not satisfied with, please give us a chance to improve your shopping experience. Contact us through the " Your Orders" tap on your Amazon account. Thank you!